Meet Amanda & Parker Vandergriff! They were married in Ft Worth this month at River Ranch Stockyards in Stockyard Station. It was such a beautiful wedding with a mix of chic decor in a country venue. Below are photos from their 1st Look. 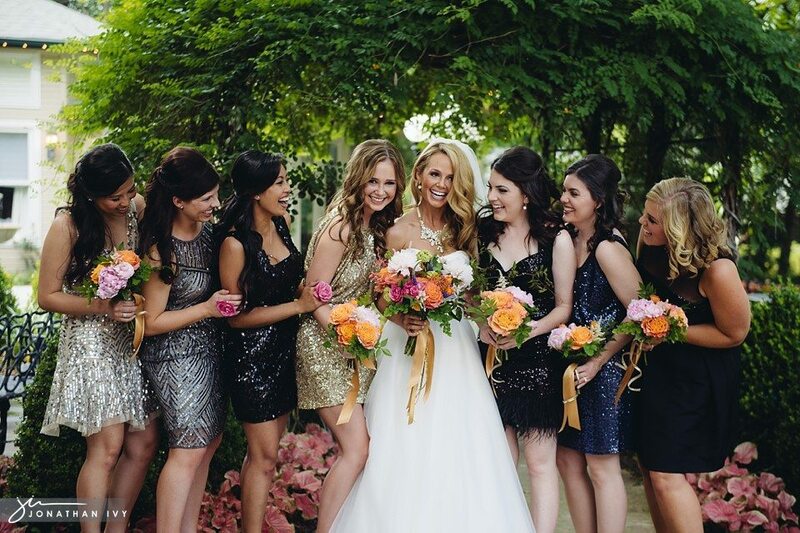 Each of the bridesmaids choice their own gown to max their personality for this glitz wedding. The couple was married at FUMC Arlington where we were able to visit their family chapel. We, of course, snagged a photo there. Their reception was a the River Ranch Stockyard. Here you can see the mix of glitz and glam in a country atmosphere. The beautiful flowers were by our sweet friend from Lewisville (our old turf) We + You – The Nest. Before the couple entered the reception they played a video they had made. It was a huge hit! The newlyweds then rapped their own entrance to Nicki Minaj along with the Dallas Mavs Drumline. We love flutter fetti during the 1st dance! The couple also had videos made for each of their parents that they played right before the Daughter & Father dance and the Son & Mother dance. How about a cake buffet! Jonathan said this was a very happy sight! We all know how he feels about cake…well dessert in general.